London Welsh put behind them the RFU's decision not to allow them promotion with a 37-21 win over Cornish Pirates in the Championship final first leg. Grant Pointer put Pirates ahead but two Alex Davies penalties, tries from Joe Ajuwa and Nick Scott and a Gordon Ross drop goal put Welsh in control. A Pirates penalty try on the stroke of half-time kept them in it, but two tries in two minutes sealed it. Hudson Tonga'huia and James Lewis went over, Phil Burgess pulled a try back. But the result was tarnished by the news that London Welsh's bid for promotion to the Premiership was rejected after the RFU threw out their plan to share with Oxford United at the Kassam Stadium. It seemed as Welsh were still mulling over the RFU's decision as the Pirates struck in the first five minutes, Pointer racing in from 20 metres out for the opening try. But then Welsh woke up, Davies reduced the arrears with two penalties, the second after Pirates' fly-half Ceiron Thomas was sin-binned for a deliberate knock-on. Welsh exploited their numerical advantage as the impressive Ajuwa went over. Despite Pirates being back to 15 men, Scott got a try after half an hour as Welsh exploited one of a number of poor line-out throws from Dave Ward. Ross added the drop goal for Welsh, before Pirates ended the half with a penalty try after a sustained period of pressure on the visitors' line to close the gap to 23-14 at the break. The home side put Welsh under tremendous pressure from the start of the second half, but Welsh held firm and exploited the Pirates' mistakes mid-way through the half. First, Tonga'uiha latched onto a pass just inside the Pirates half and found a gap in the defence to sprint unchallenged under the posts. Straight from the restart, Welsh capitalised on a Pirates mistake at the ruck, Rob Lewis breaking into home territory before giving it to James Lewis who went over in the left corner. Burgess pulled a try back with 10 minutes to go after Welsh were reduced to 14-men after Tonga'uiha was sin-binned for a dangerous tackle. Welsh take a 16-point lead into next week's second leg at the Kassam Stadium. "We got what we deserved. We were second in too many facets of the game. "London Welsh took their chances and I'm quite happy to only be 16 points behind to be perfectly honest. "In the first half we got caught up in the emotion of it. We scored early and maybe we relaxed a bit too much after that. "We want to win things, we want to win trophies. Obviously it'd be nice if we were playing for promotion to the Premiership because the players, to a man, want to play at the top table." "We're very pleased with the result but also the way we played as well. 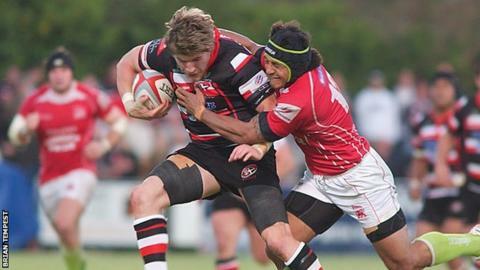 "To score 37 points at the Cornish Pirates is a hell of statistic and it couldn't have gone better for us." On the RFU ruling to deny his side promotion:"We understood what the RFU ruling was and we needed to put that behind us. "We can't influence that. All we can influence is what's on the field and that's what we did and we're pleased. "The players are disappointed because they feel they are putting the correct rugby together to be able to have a chance in the Premiership. "The players think it's a negative move for English rugby because that channel for promotion and demotion needs to be open at all times for all sides."